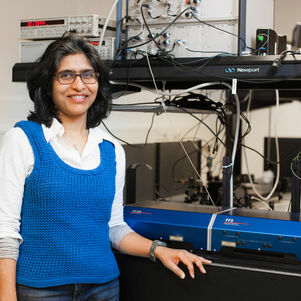 Nandini Bhattacharya did her Ph.D. (1998) from the T.I.F.R. in Mumbai, India. Her thesis work was based on the spectroscopy and lifetime studies of highly charged ions. She did her post-doctoral work in the Van der Waals-Zeeman Instituut in the Universiteit van Amsterdam. In this period she worked on experiments which use light to manipulate atoms and on classical wave implementations of elements in quantum information theory. Her present research interests are in techniques for metrology, MID spectrosocopy, speckle metrology. “Multi-correlation fourier transform spectroscopy with the resolved modes of a frequency comb laser”, M. Zeitouny, P. Balling, P. Kren, P. Masika, R. C. Horsten, S. T. Persijn, H. P. Urbach, and N. Bhattacharya. Multi-correlation fourier transform spectroscopy with the resolved modes of a frequency comb laser. ANNALEN DER PHYSIK, Vol. 525(6):437–442, (2013). "Many-wavelength interferometry with thousands of lasers for absolute distance measurement", S.A. van den Berg, S.T. Persijn, G.J.P. Kok, M.G. Zeitouny, and N. Bhattacharya, PHYSICAL REVIEW LETTERS Vol. 108, 183901 (2012). “Long distance measurement with femtosecond pulses using a dispersive interferometer”, M. Cui, M. G. Zeitouny, A. J. E. M. Janssen, N. Bhattacharya, S. A. van den Berg and H. P. Urbach, OPTICS EXPRESS, Vol. 19, 6549, (2011).
" High Accuracy Long Distance Measurements in Air with a Frequency Comb Laser “, M. Cui, M.G. Zeitouny N. Bhattacharya, S.A. van den Berg, H.P. Urbach, and J.J.M. Braat,, OPTICS LETTERS, Vol. 34, 1982, (2009). "Laser speckle based detection of fluid pulsation in presence of motion artifacts: in-vitro and in-vivo study", M.Nemati, R. W. C. G. R. Wijshoff, J. M. A. Stijnen, S. van Tuijl, J. W. M. Bergmans, N. Bhattacharya and H. P. Urbach, OPTICS LETTERS, Vol. 38(24):5334–5337, Dec 2013. “Implementation of quantum search algorithm using classical Fourier optics,” N. Bhattacharya, H. B. van Linden vanden Heuvell, and R. J. C. Spreeuw, PHYSICAL. REVIEW. LETTERS. Vol. 88, 137901 (2002).